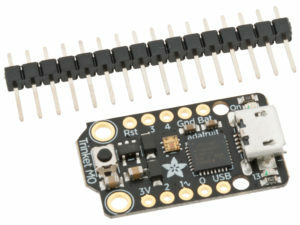 The Adafruit Trinket M0 may be small, but do not be fooled by its size! 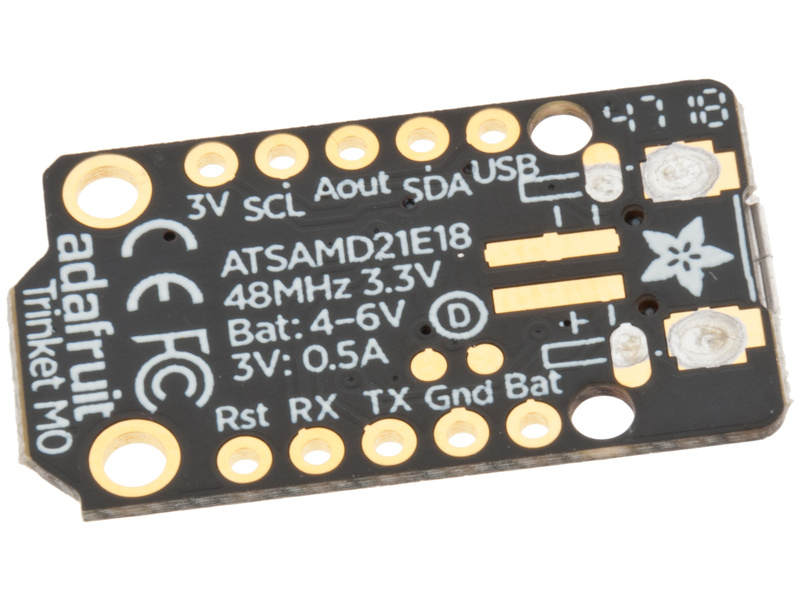 It’s a tiny microcontroller board, built around the Atmel ATSAMD21, a little chip with a lot of power. We wanted to design a microcontroller board that was small enough to fit into any project, and low cost enough to use without hesitation. Perfect for when you don’t want to give up your expensive dev-board and you aren’t willing to take apart the project you worked so hard to design. It’s our lowest-cost CircuitPython programmable board! We’ve taken the same form factor we used for the original ATtiny85-based Trinket and gave it an upgrade. The Trinket M0 has swapped out the lightweight ATtiny85 for a ATSAMD21E18 powerhouse. It’s just as small, and it’s easier to use, so you can do more. The most exciting part of the Trinket M0 is that while you can use it with the Arduino IDE, we are shipping it with CircuitPython on board. When you plug it in, it will show up as a very small disk drive with main.py on it. Edit main.py with your favorite text editor to build your project using Python, the most popular programming language. No installs, IDE or compiler needed, so you can use it on any computer, even ChromeBooks or computers you can’t install software on. When you’re done, unplug the Trinket M0 and your code will go with you. Please check out the Trinket M0 CircuitPython guide for a list of capabilities and quick-start code examples – CircuitPython is easier to code but not as low-level and complete as Arduino. All 5 GPIO pins are available and are not shared with USB – so you can use them for whatever you like! Can drive NeoPixels or DotStars on any pins, with enough memory to drive 8000+ pixels. DMA-NeoPixel support on one pin so you can drive pixels without having to spend any processor time on it. Native hardware SPI, I2C and Serial available on two pads so you can connect to any I2C or Serial device with true hardware support (no annoying bit-banging). You can have either one SPI device or both I2C and Serial.